Go to original pattern for design DROPS 177-18. Crochet circle jacket in DROPS BabyMerino. Sizes S - XXXL. DROPS CROCHET HOOK SIZE 3.5 MM/E/4 – or the size needed to get 22 double crochet and 12 rows on 10 cm / 4'' in width and 10 cm / 4'' in height. 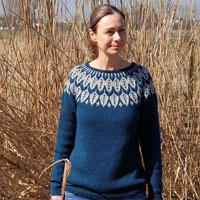 You can get the yarn to make this pattern from	29.40$. Read more. 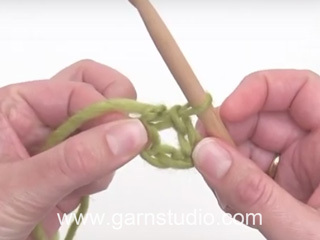 The first single crochet at the beginning of the round is replaced by 1 chain stitch, the round is finished with 1 slip stitch in the 1st chain stitch at the beginning of the round. 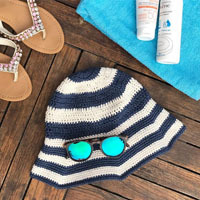 The first double crochet at the beginning of the round is replaced by 3 chain stitches, the round is finished with 1 slip stitch in the 3rd chain stitch at the beginning of the round. The first treble crochet at the beginning of the round is replaced by 4 chain stitches, the round is finished with 1 slip stitch in the 4th chain stitch at the beginning of the round. 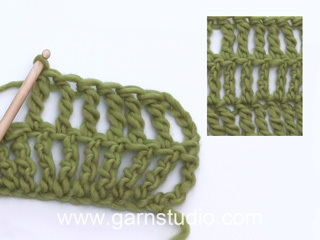 Work 4 chain stitches with hook size 3.5 mm/E/4 and light sea green and form them to a ring with 1 slip stitch in the first chain stitch. Continue working according to diagram A.1. READ CROCHET INFO! REMEMBER THE CROCHET GAUGE! 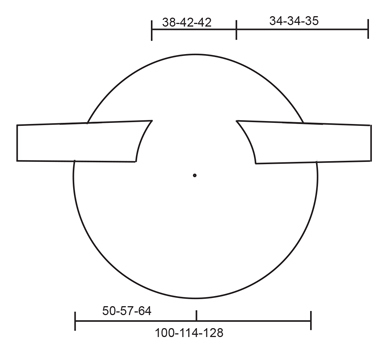 When A.1 has been completed, the circle measures approx. 26 cm / 10 1/4'' in diameter and there are 27 treble crochet groups on the round. 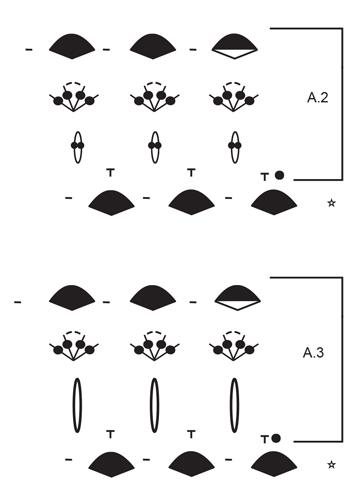 Work according to A.2, on the first round in A.2 increase 9 chain-spaces evenly along the round, increase in the same way as on round 6 in A.1, i.e. increase 1 chain-space as follows: work 1 single crochet around the chain-space in the middle of the treble crochet group, 9 chain stitches, 1 single crochet around the chain stitch between the treble crochet groups, 9 chain stitches, 1 single crochet around the chain-space in the middle of the next treble crochet group = 36 chain-spaces. Complete A.2 1 time in height. Sizes L/XL-XXL/XXXL: When A.2 has been completed 1 time in height, continue working according to A.3, increase in the same way as in A.2 – work 1 double crochet group more between each increase, every time you increase = 45-45 treble crochet groups. 1 single crochet around the chain-space in the middle of the treble crochet group, work 33-36-39 loose chain stitches, skip 6-7-8 treble crochet groups, 1 single crochet around the chain-space in the middle of the next treble crochet group (you have now worked one armhole), * 12 chain stitches, 1 single crochet around the chain-space in the middle of the next treble crochet group *, repeat from *-* in total 14-20-18 times, work 33-36-39 loose chain stitches, skip 6-7-8 treble crochet groups, 1 single crochet around the chain-space in the middle of the next treble crochet group (you have now worked one more armhole), * 12 chain stitches, 1 single crochet around the chain-space in the middle of the next treble crochet group *, repeat from *-* to the end of the round, but finish with 1 slip stitch in the first single crochet at the beginning of the round (instead of 1 single crochet around the next chain-space). 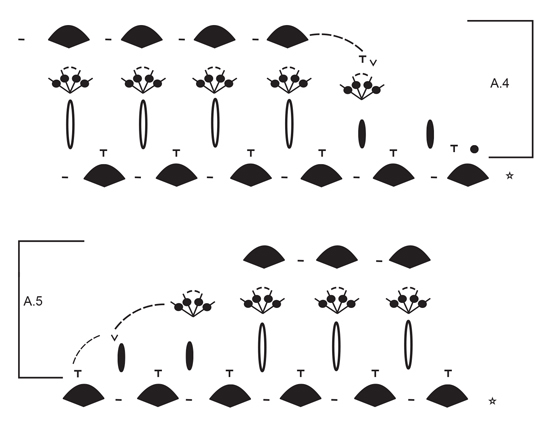 The next round is worked in the same way as round 2 in A.3 as follows: work in the same way as before with 2 double crochet + 2 chain stitches + 2 double crochet around each chain-space, around each chain-space for the armhole work 7-8-9 double crochet groups, AT THE SAME TIME increase 9 double crochet groups evenly along the round, increase 1 double crochet group by working 2 double crochet + 2 chain stitches + 2 double crochet + 2 double crochet + 2 chain stitches + 2 double crochet around 1 chain-space = 45-54-54 double crochet groups. ROUND 3: Work 2 treble crochet + 2 chain stitches + 2 treble crochet around the chain-space in the middle of each double crochet group and 1 chain stitch between each treble crochet group = 45-54-54 treble crochet groups with 1 chain stitch between each. ROUND 1: Work slip stitches to the middle of the first chain-space (in the middle of a treble crochet group), 1 single crochet, * 12 chain stitches, 1 single crochet around the next chain-space in the middle of a treble crochet group *, repeat from *-* the whole round AT THE SAME TIME as you increase 9 chain-spaces evenly along the round = 54-63-63 chain-spaces (finish the round with 6 chain stitches and 1 double treble crochet in the first single crochet at the beginning of the round). ROUND 2: Work 2 double crochet + 2 chain stitches + 2 double crochet around each chain-space the complete round = 54-63-63 double crochet groups. ROUND 3: Work 2 treble crochet + 2 chain stitches + 2 treble crochet around each chain-space in the middle of the double crochet group and 1 chain stitch between each treble crochet group the whole round = 54-63-63 treble crochet groups with 1 chain stitch between each. 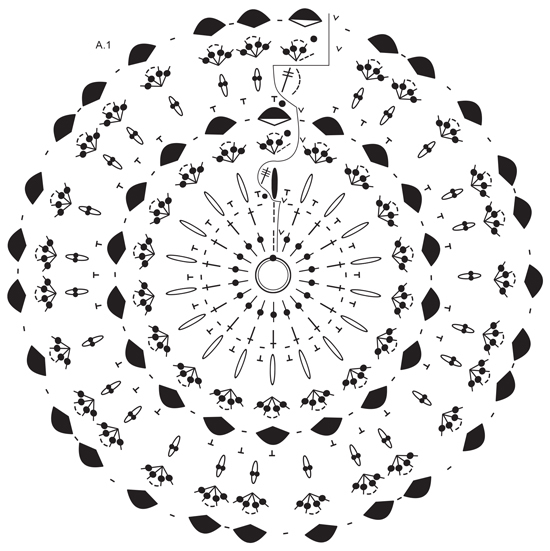 Repeat 1st-3rd round 5-5-6 times more, AT THE SAME TIME increase 9 chain-spaces every time you work round 1 = 99-108-117 treble crochet groups. 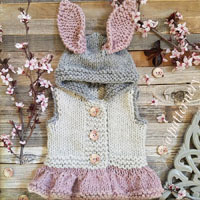 So that the jacket is given an oval shape, continue by working back and forth over only the bottom 62-67-72 treble crochet groups, do not work over the middle 37-41-45 treble crochet groups at the top of the neck. Start from the right side and repeat rows 1-3 in A.3 as before a total of 2 times (i.e. the back piece gets 6 more rows in height), to get a neat transition every time you turn the piece, work as shown in A.4 and A.5, AT THE SAME TIME increase 7 chain-spaces every time you work row 1 (= a total of 113-122-131 treble crochet groups on the round including the treble crochet groups towards the neck). ROUND 1: * 4 chain stitches, 1 single crochet around the chain-space in the middle of one treble crochet group, 4 chain stitches, 1 single crochet around next chain-space (between 2 treble crochet groups *, repeat from *-* the whole round. ROUND 2: *4 chain stitches, 1 single crochet in single crochet *, repeat from *-*- the complete round and finish with 1 single crochet in the last single crochet. Cut and fasten the strand. Crochet up 66-72-78 double crochet around the armhole (approx. 5 double crochet in each treble crochet group and approx. 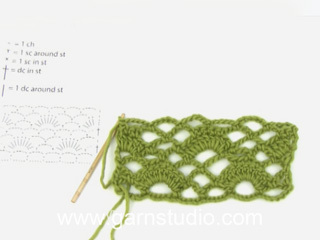 33-36-39 double crochet around the chain-space – start mid under the sleeve). * 1 double crochet in the first/ next double crochet, 1 chain stitch, skip 1 double crochet *, repeat from *-* the whole round = 33-36-39 double crochet + 33-36-39 chain stitches. ROUND 1: * 6 chain stitches, skip 5 double crochet/chain stitches, 1 single crochet in the next double crochet/chain stitch *, repeat from *-* the whole round = 11-12-13 chain-spaces. ROUND 2: Work 2 double crochet + 2 chain stitches + 2 double crochet around each chain-space the whole round = 11-12-13 double crochet groups. 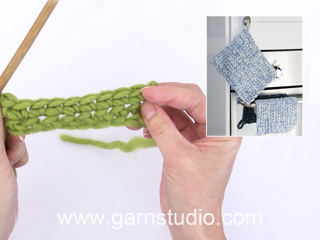 ROUND 3: Work 2 treble crochet + 2 chain stitches + 2 treble crochet around each chain-space in the middle of the double crochet group and 1 chain stitch between each treble crochet group the whole round = 11-12-13 treble crochet groups with 1 chain stitch between each. ROUND 4: * 12 chain stitches, 1 single crochet around the chain-space in the middle of the treble crochet group *, repeat from *-* the whole round = 11-12-13 chain-spaces, but decrease at the same time 1 chain-space on the round mid under the sleeve as follows: 1 single crochet around the chain-space in the middle of the next-to-last treble crochet group on the round, 6 chain stitches, 1 double crochet around the chain-space in the middle of the treble crochet group to be skipped, 6 chain stitches, 1 single crochet around the chain-space in the middle of the next treble crochet group = 10-11-12 treble crochet groups. Repeat rounds 2-4 and decrease at the same time 1 chain-space every 3rd round so that for each repeat in height there will be 1 treble crochet group/chain-space less on the round. When there are 6-7-8 treble crochet groups/chain-spaces on the round, continue working without decreases until the sleeve measures 34-34-35 cm / 13½"-13½"-13 3/4", or to desired length, try the jacket on as you go. Cut and fasten the strand and repeat on the other sleeve. Buongiorno Virginia. Purtroppo in questa sede non riusciamo a dettagliare le spiegazioni. Verifichi di aver aumentato i 7 archi di cat quando lavora la prima riga di A3 e di contare nei gruppi di m.a doppie anche quelle verso il collo. Per un aiuto più personalizzato , può contattare il suo rivenditore Drops di fiducia, mandando anche una fotografia del suo lavoro . Buon lavoro! Hej Stine, Du starter i midten af cirklen som er A.1 og følger diagrammet mod solen række for række. God fornøjelse! La hice y me quedó hermosa!! In het overzicht mis ik telpatroon A1. Ook in het printoverzicht. Hoop dat u mij snel kunt helpen; wil graag beginnen. Dag Elly, A.1 staat helemaal bovenaan bij de telpatronen. Het is het cirkelvormige telpatroon. Liebe Jessica, die Doppelstäbchen Gruppe starten Sie am Anfang der Reihe wie im A.5 (= Rückreihe), dann wie zuvor im A.3 und dann wie im A.4 enden. 3. Reihe wird wie im A.4 angefangen und wie im A.5 enden. Viel Spaß beim häkeln! So ich habe nochmal aufgeribbelt. Ich habe bei den 67 Stäbchen Gruppen 7 Luftmaschenbögen zugenommen wie beschrieben. Dann komme ich auf 74 Luftmaschenbögen. Da man nach A4 und A5 häkelt, Maschen überspringt damit der Übergang ja schöner aussieht, werden die Maschen ja weniger. Oder muss man wie vorher schonmal bei den Ärmelanfängen Doppelstäbchen zunehmen? Ich bin gerade wirklich überfordert. Liebe Jessica, wenn Sie über die unteren 67 Stb-Gruppen häkeln, müssen Sie von Anfang an mit A.4/A.5 am Anfang/Ende jeder Reihe häkeln, es sind dann weniger Gruppen um die Zunahmen zu häkeln aber trotzdem 7 Lm-Bögen regelmäßig verteilt über die unteren Maschen/Stb-Gruppen häkeln. Viel Spaß beim häkeln! Liebe Jessica, für die ovale Form häkeln Sie über die unteren 67 DStb-Gruppen (mit A.4 und A.5 anfangen/enden und A.3 inzwischen wiederholen); die 3 Reihe von A.3 wiederholen Sie 2 x gleichzeitig 7 Lm-Bögen bei jedem 1. Reihe zunehmen = es sind dann 81 DStb-Gruppen + die oberen 41 DStb-Gruppen = 122 DStb-Gruppen insgesamt. Wahscheinlich haben Sie irgendwie alle Zunahmen nicht gehäkelt. Viel Spaß beim häkeln! Liebe Frau Thum, ja genau, Sie sollen 67 Stb-Gruppen unten und 45 Stb-Gruppen oben haben, und dann nur auf den unteren 67 Stb-Gruppe häkeln. Sollte es nicht genau die Mitte sein, ist auch schon ok und wird dann mit der Kante nicht bemerkt. Viel Spaß beim häkeln! Liebe Frau Thum, am Anfang der Reihe häkeln Sie A.4, dann A.3 wie früher wiederholen und mit A.5 enden (= A.4 und A.5 werden den ovalen Form geben). Von der Rückseite häkeln Sie zuerst A.5 dann A.3 und mit A.4 enden. Viel Spaß beim häkeln!